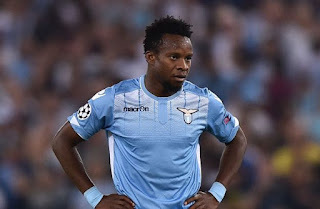 Nigeria midfielder Ogenyi Onazi has claimed Harry Redknapp attempted to sign him during his managerial career at Premier League giants Tottenham. Seventy-year-old Redknapp, who managed the Spurs between 2008 and 2012, is English Championship side Birmingham City’s current manager. Onazi, 24, played himself into the spotlight at the Nigeria 2009 FIFA Under-17 World Cup and attracted interest from a slew of clubs in Europe. However, he settled on a move to Italian Serie A side Lazio in 2011. The Jos-born player later turned into an important player for the Biancocelesti between 2012 and 2014. The holding midfielder, who swapped Lazio for Turkish club Trabzonspor last year, was denied a chance to join Birmingham, during the summer transfer market after he was denied a work permit to ply his trade in England. And the South Africa 2013 Africa Cup of Nations winner, who is targeting a move to Birmingham during the next transfer window in January, has revealed Redknapp is very keen to work with him, although he did not give the reason for the Englishman’s failure to sign him when he was at the helm at Tottenham. “I am still in talks with Harry Redknapp,” Turkish newspaper Fanatik quoted Onazi as saying on Thursday. “Harry Redknapp has wanted me since he was at Tottenham. The transfer stalled but we have stayed in contact ever since. “He wanted me at Tottenham because he believed I was good enough to play in the Premier League. Onazi has one goal to his name in two appearances for Trabzonspor this season. The player, whose contract at the Medical Park Arena ends in 2019, is desperate to get his career back on track, and a move to Birmingham could help him retain his Super Eagles’ first-team place. Onazi produced a strong performance in the Eagles’ 2018 World Cup qualifying double-header against Cameroon in Uyo and Yaoundé this month. Nigeria won the first leg in Uyo 4-0 and battled to a 1-1 draw against the African champions in Yaounde. Meanwhile, Trabzonspor manager Ersun Yanal is pleased with Onazi’s response after his late introduction in the 3-1 win over Genclerbirligi in their Super Lig fixture on Saturday.